Many horses don’t stand still when the rider is mounting because they were never taught to stand still. 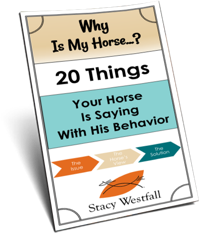 Often people ‘hope’ the horse will stand and then ‘correct’ or punish the horse if they don’t stand…but they don’t teach the horse a cue that means stand still. 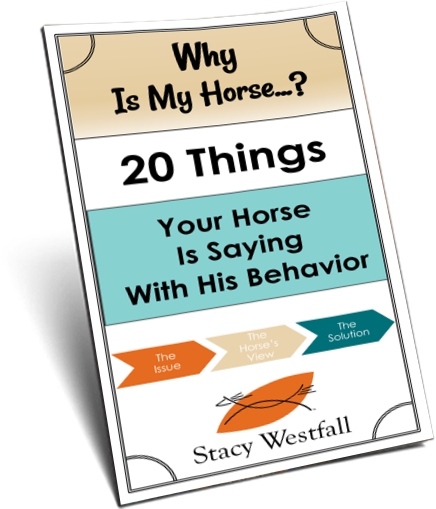 I teach my horses that when I bend their head around, without any kind of ‘go forward’ cue, then they should stand still. I do this by bending and holding the bend until the horses feet stay still. If you have ever struggled to get a horse to stand still while you are mounting you may want to consider going back to the basics with that horse. ← If someone is going down the wrong road, he doesn’t need motivation to speed him up. What he needs is education to turn him around. I have some footage but not enough to make it complete yet. I am working on it. The spin stuff with Jac is pretty complete except adding speed. here is one for you…I am sure it will spin ya head around……. how many HATS and BOOTS do you own??? …..lol…. I am sorry I am the only one asking questions on here…. but…I have another one…. and possibly even more questions…so brace yourself…..lol…. but why you are saying it is ok with Jac spinning on the ‘wrong’ foot in episode 29??? …I was hoping someone would ask this again…….oh I have more questions too…lol… will wait to see if someone else ask them first…..thanx!! I was wondering about the head tilt you brought to our attention in the early training and then you mention it several times in other videos and said you would “work on that later”….. my question is: is he still doing this or have you fixed it and what did you do to fix it?… thanx!